Sum-sum-summertime means grill-grill-grilling and nom-nom-nomming. And your toothsome trifecta starts right here: enter to win, and be one of the first to get your hands on, the Elevate Grill, a brand new portable gas BBQ from PointElevate! A $250 value! 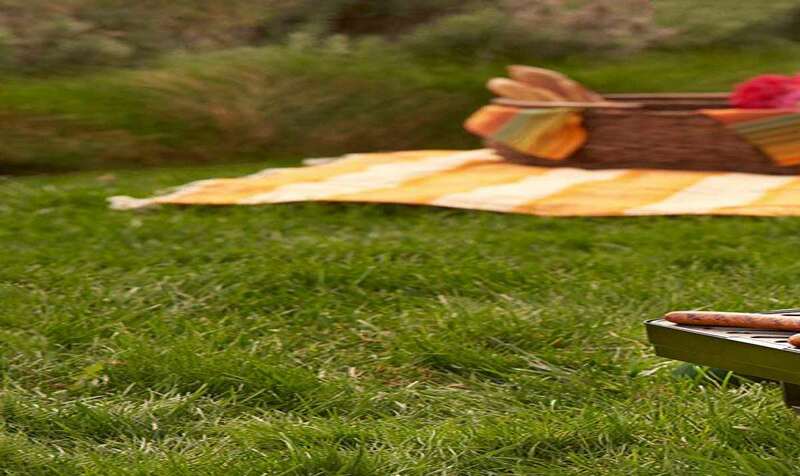 PointElevate touts its Elevate gas grill's 286 square inches of grilling space as the largest available that still folds to a size compact enough to tote to the beach or tailgate, plus store snugly in the garage or a closet when not in use. 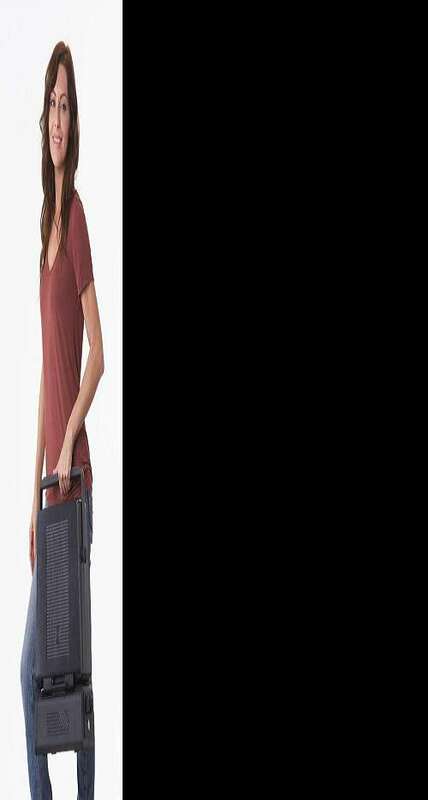 It weighs just 24 pounds and condenses to 6" wide x 19" high x 14" deep. That's smaller than a carry-on. I wonder if they would let me bring a can of propane on the airplane if I agreed to grill kebabs for everyone on the flight. 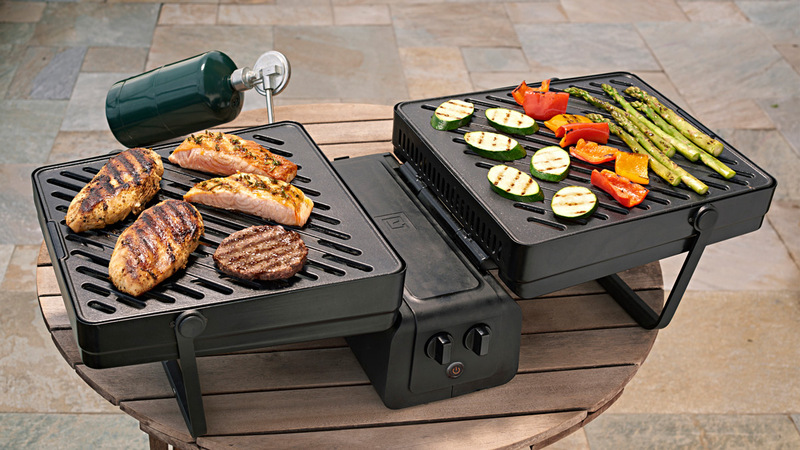 Unfolded the Elevate is still small enough to set on a table, but boasts a surface area large enough to grill food for an entire army. Or at least a family of 6. 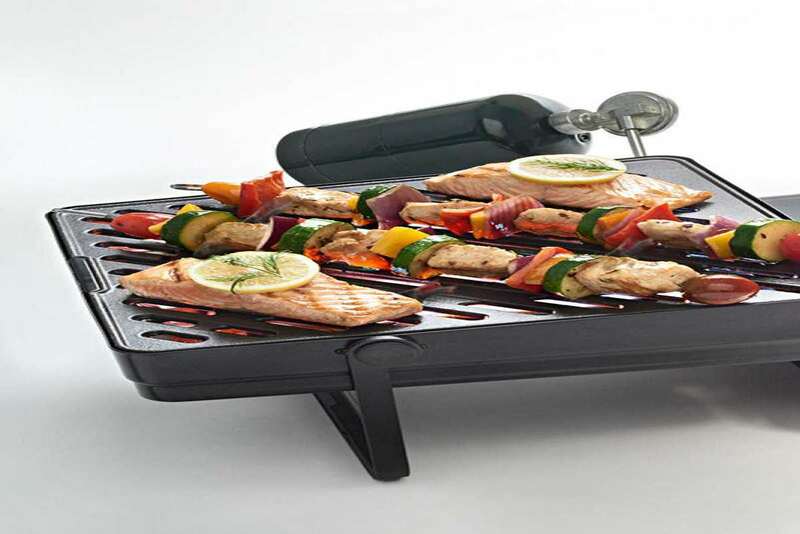 It features dual cooking surfaces with electronic ignition, plus individual burner controls. Heat output is 14,000 BTU. Elevate Grills cook all types of food atop their porcelain-enameled cast iron grates. 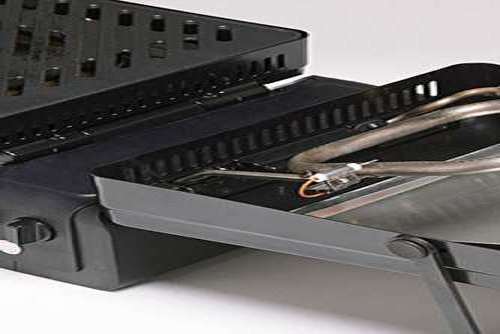 Removable grease trays trap drippings and are dishwasher safe. 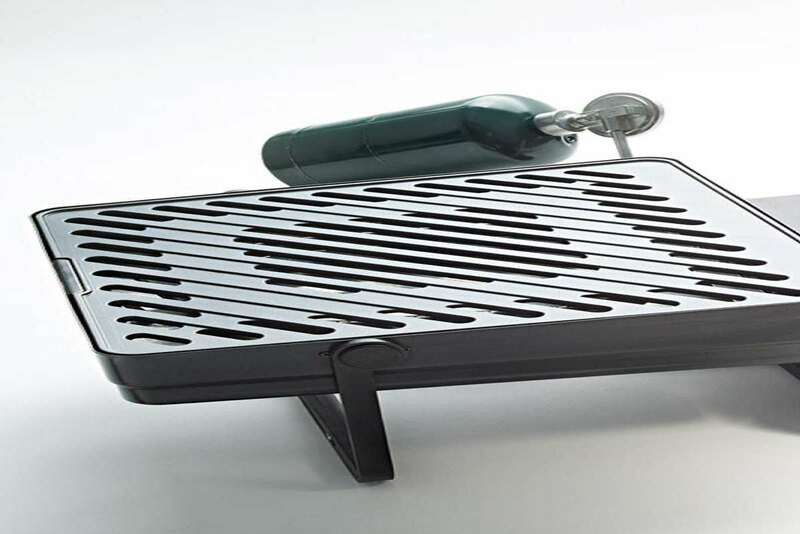 Elevate Grills also include a propane storage compartment for transporting and a grate removal tool for cleaning. To register, click here and fill out the Elevate Portable Gas Grill Giveaway entry form. Or, if you're already a member of DudeIWantThat.com, when the magic entry form button appears, just click it to enter. 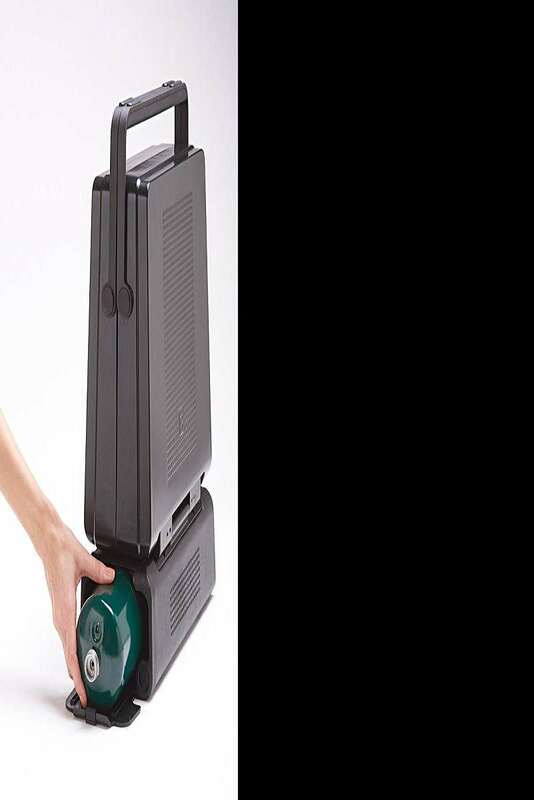 Giveaway prize includes: 1 x Elevate Grill and 1 x grate removal tool. Total retail value is approximately $250. PointElevate is currently running its Elevate Grill as a Kickstarter campaign. BBQ lovers on the go can pledge for theirs on the company's project page through May 1, 2015. Special introductory rates ranging from $130 to $185 are available to Kickstarter backers. Anticipated grill delivery date for backers is June 2015. (Dude's giveaway winner will receive his/her prize within 3 weeks of the giveaway's conclusion.) Once the Kickstarter campaign concludes, interested grillers can grab an Elevate here. Congratulations to Leland C. of Browning, MT, winner of the Elevate grill. Thanks to all entrants, and be sure to check the Dude homepage or Dude Giveaways section for your chance to enter our latest prize drawing.